Hi everyone and Happy Thursday! Last week while I was at the grocery store I noticed strawberries popping up in the produce section. When I see Strawberries I know Spring is just around the corner. I can't wait, because I love strawberry season. They're a bit pricey ($3.98 lb) since it's still early in the season, so I haven't really purchased any. packages of strawberries for .49! I'm so glad they built a Aldi's closer to me and that it's finally opened. They have such awesome prices on their produce. I plan on heading back to get four to five more pounds so I can make another batch of Homemade Strawberry Jam. We go through jam like crazy. At those prices I might make a double batch. 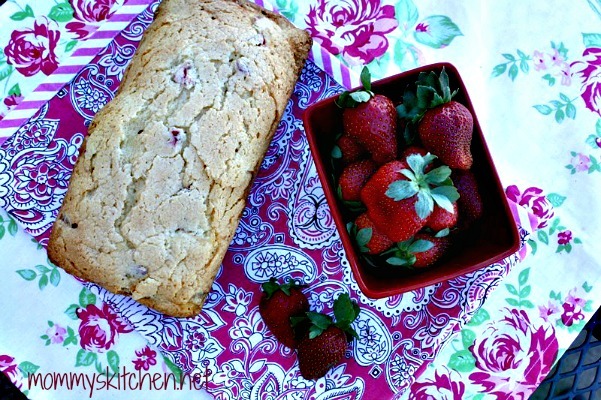 As soon as strawberry season hits I immediately want to make strawberry bread. 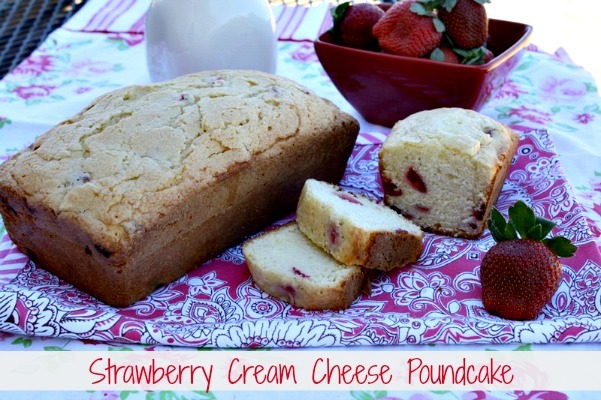 This time I thought I would change it up a bit and make a Strawberry Cream Cheese Pound Cake instead. I love strawberry bread, but it can be a little heavy and dense for my taste. I wanted a lighter version, so I experimented with the recipe a bit and came up with this yummy strawberry pound cake. This recipe would be perfect if you have strawberries that need to be used up. By using cake flour instead of all purpose the pound cake was light and fluffy and not dense and heavy. I'm glad I decided to use cream cheese, because it added a nice richness as well as moistness to this yummy pound cake. I used my stand mixer with the paddle attachment. Before preparing the batter I chopped up the strawberries in a separate bowl and sprinkled them with a tablespoon of sugar. This way they could get nice and juicy while I prepared the batter. Once the batter was prepared I added the strawberries with juice and gently folded them into the batter. I used one 9x5x3 inch loaf pan and 3 mini loaf pans (so I could share with my neighbor). You can also use a bundt pan or 10 inch tube pan. I hope you will give this recipe a try. I loved this pound cake so much that it was hard to share it with my neighbor, but I did. When it's blueberry season I think a Blueberry Cream Cheese Pound Cake would be perfect. Preheat oven to 350 degrees. Chop strawberries and place in a bowl sprinkle 1 tablespoon of sugar. Gently mix and set aside. Combine cake flour and baking powder in a separate bowl and set aside. In a large bowl beat butter and cream cheese on medium speed with an electric or stand mixer until light and fluffy. Add sugar and vanilla extract mix until combined. Add eggs on at a time beating just until blended and then add the milk. Slowly add the flour mixture and blend until combined. Add the strawberries with juice and fold into batter. Pour batter into two greased and floured 9 x 5 x3 inch loaf pan, bundt pan or 10 inch tube pan. Bake at 350 degrees for 40 - 45 minutes. If using a bundt pan increase baking time 55 - 60 minutes. Cook's Notes: I used all sugar for this pound cake, but I've used Truvia Baking blend with great results as well. If you're looking for a less sugar version I highly recommend giving it a try. Just use half as much Truvia Baking Blend as you would sugar. For this recipe it would be 1 - cup + 1/2 tablespoon. Tina ~ this pound cake looks scrumptious...I'm ready for the strawberries and Spring...not necessarily in that order :) I do like the addition of the Truvia Baking blend in your recipes. I started off using it in my coffee! Tina, I bet this bread is scrumptious!! 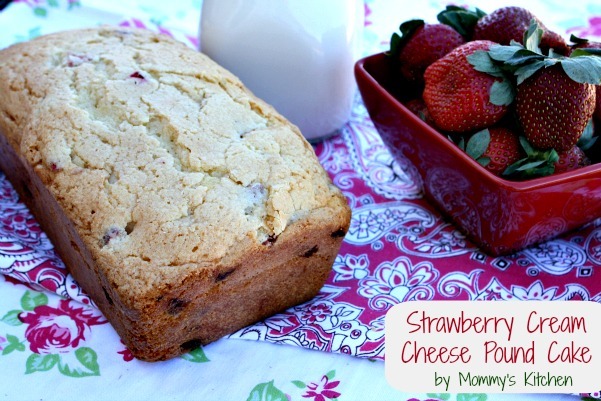 I love moist strawberry bread, but the cream cheese probably makes it over the top! Looks great! I'm going to have to try this soon. I need to check out the Aldi soon. Have been in one yet. :-) Have a great weekend, Tina. Lovelly recipe and now the strawberry's are showing in the markets it's time to enjoy them . Aldi always has amazing deals on produce!!! Love this bread Tina! This looks completely delicious. I might try it at home but upping the amount of strawberries in it, just cause I like to guarantee a strawberry in each bite! This was incredible. Online recipes often let me down, but this was amazing!!!! Thanks so much. This is incredible!! Wow, just made this last night very good and moist. Can u use strawberry extract instead of fresh strawberries?